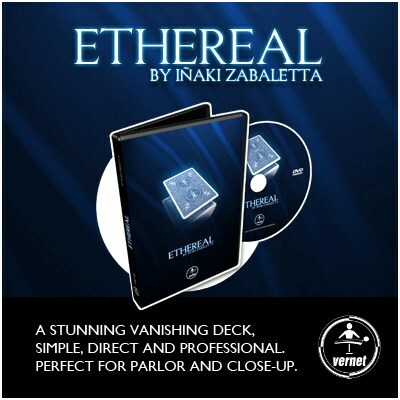 By "No Way Bottle Production" creator, here comes "Ethereal"; a stunning vanishing deck, simple, direct and professional. Perfect for parlor and close-up. The magician shuffles a deck of cards in front of the audience, and asks a spectator to peek and remember one of them. Then, he takes a regular handkerchief and openly covers the deck. A spectator now holds the deck and the handkerchief very clearly while the magician shows his hands completely empty. Then the magician recovers deck and handkerchief and announces that he is going to make the chosen card vanish. After a magic gesture THE WHOLE DECK VANISHES except one card: the chosen one. The magician gives the card to the spectator as a souvenir. AN INCREDIBLE EFFECT. IDEAL TO END A SESSION. You Can Do It Surrounded And Right Under The Spectators' Very Noses.